Frame your story: Make sure you’re including every side to your story before presenting our ideas or facts. It’s nice for the viewer to understand all sides of a topic before you move on to our specific idea. This is the research portion of the assignment. Plan your delivery: how will you deliver this presentation? Will it be bold and direct, as if you’re trying to persuade someone, or is it just stating the facts, in which you should try to refrain from just listing. Choose your multimedia: what platform will you use to deliver your presentation? You can choose a documentary, slides, etc. Make it colorful and entertaining to grab the attention of the audience. Put it together: practice your speaker notes, and make the final edits and cuts. If you had all your research on a Google Doc spend this last portion of time transferring it to a more entertaining presentation source and finish making it look like you want it to. Speaker Notes: Organize the PowerPoint/information in an order that makes sense. If you are presenting a topic that many people are unfamiliar with, this is key. The audience most likely does not have as deep an understanding on the topic, so formatting will best prevent confusion and know what you will say before hand to avoid confusion. At the end of the presentation, review information. By reviewing the information you spoke about at the end of the presentation, you give the audience members a chance to ask questions and reflect. This also frames the bigger picture of your topic. Ask if there are any questions, and be prepared to answer them. This means you may need to do extra research on your topic in order to ensure you can answer these questions. Asking for questions assists the audience in getting the most out of your presentation. Add images. Incorporating visual aids into your presentation will bring it together and add another perspective of the topic. Not all audience members respond to listening or reading. Speak up. Projecting and enunciating while speaking makes your presentation more engaging. Nobody wants to watch a student mumbling words off of a notecard! Incorporate the audience. Ask questions or play a quick game with the audience to keep them engaged. This brings your presentation to another level. The teacher grading your presentation is often impressed if you are able to teach the class. Don’t chew gum/eat. Although this often goes unspoken, it’s important not to be eating a snack, chewing gum, or drinking from a water bottle during your presentation. This lowers the professionality of your presentation and can get annoying. Don’t read directly off of a notecard or iPad. This is not as engaging to the audience and does not display your knowledge on the topic well. Instead, use a notecard/iPad as a quick reminder of what you will say. A good way to prevent the temptation to read off of a notecard/iPad is to only include bullet points. This way, you are forced to elaborate on the topic. 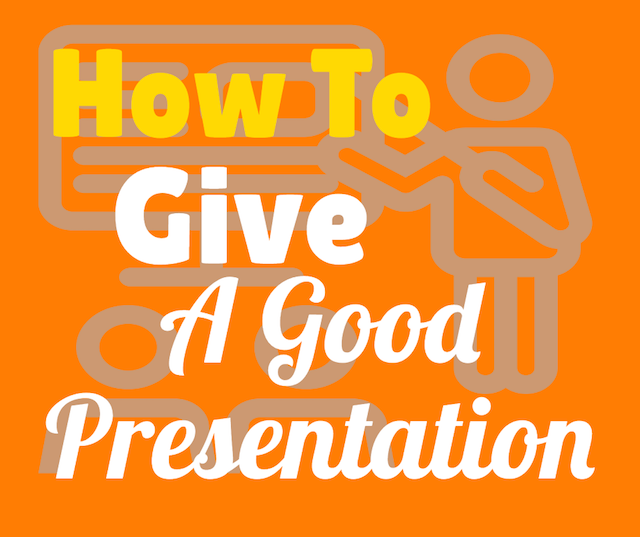 Hopefully, by following these simple instructions you are able to put together a wonderful presentation! Nothing can beat nerves but it only means you care. Now you have done everything you can to prepare and you’ll nail the presentation so good luck!